Devin Sweet has posted the schedule for February’s PACWEST Poker Classic at Chinook Winds in Lincoln City. 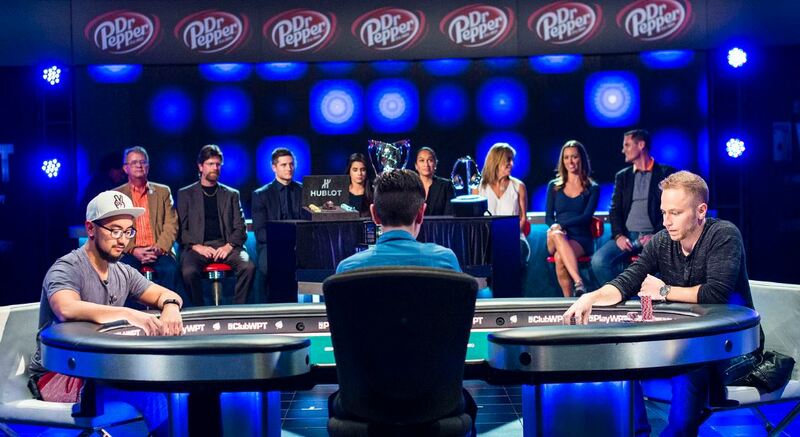 The LAPC is one of the few series that rivals the WSOP in scope, if not in sheer scale. Running through most of January and all of February, there are a total of 67 events with buyins ranging from $175 for a $250K GTD, in the middle of January to a $25K buyin High Roller to a WPT $10K buyin Main Event with a $1M guarantee for first place. Last year’s Main Event had 521 entries, with champion Daniel Strelitz taking home just over a million. The series is made up of several large-guarantee signature events leavened by a large number of small-field mixed-game tournaments. For instance, the $570 Big O tournament (30 January) drew just 52 entries in early February 2017 (with Joe Brandenburg taking 2nd in a 3-way deal and Bryce Burt getting 6th). Even the $350 PLO8 only drew 103 entries, with less-common poker games like 2-7 Triple Draw only getting 40 entries (though it was $1,100 entry). Nearly 30 of the events are non-NLHE (with one of them being a mix of PLO and NLHE). The Wynn just announced a weekend series coming up in the second half of January. I missed posting the first episode of the fourth PokerTime session last week because it wasn’t out before I finalized the Planner, so here are a couple to catch you up. Not much happening out there in the poker tournament world, but you can be sure that if something is happening in poker in 2017 it probably involved Max Young, who took fourth place at the Colorado Poker Championship Main Event in Black Hawk, a $1,100 buyin with just over 300 entries. OK. Zero sessions is definitely the least amount of poker I’ve played in a week since I started my tracking database in May of 2011, and that includes previous Christmases. The Wednesday 1pm satellites for the Tulalip Poker Pow Wow run through 17 January. 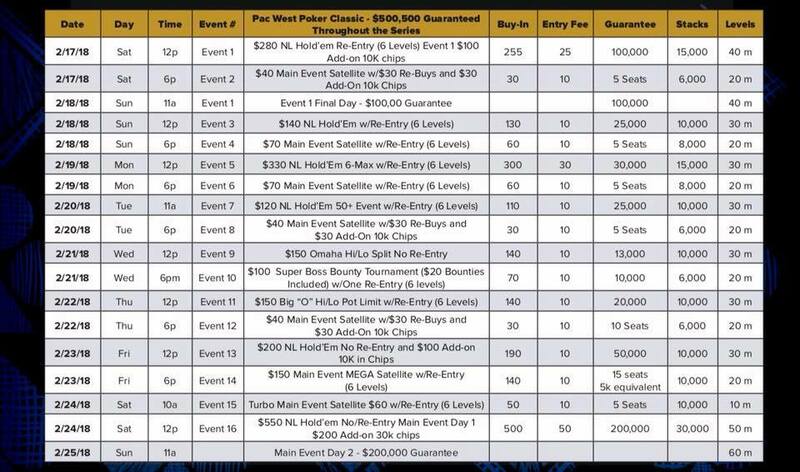 The satellites are $60, with 1 out of 10 entries winning a seat into the Main Event, with an extra seat added to each tournament. There’s another satellite on Saturday at 3pm with a $120 buyin, 1 Main Event seat for every 5 entries and 2 added seats. The Venetian New Year’s Extravaganza runs through 7 January. The big tournament of the series starts today (with entry days Thursday and Friday), a $250K GTD with a $400 buyin. Day 2 is 30 December and you can get home with your winnings for New Year’s Eve! The Muckleshoot 5th Sunday tournament is New Year’s Eve at 10am. $400 buyin with $3K added. Note the early start for this tournament. The Gardens Poker Championships starts Monday at The Gardens in LA. There’s a $550 buyin PLO 6-Max on 2 January, a (limit) Big O/7-Card Stud Hi-Lo tournament ($340 buyin) two days later, and a single entry day $100K GTD on the first Friday of the new year ($175 buyin, $100 addon). Heartland Poker Tour is at Ameristar East Chicago starting next Thursday, with a $200K GTD opening event (starting days 4–6 January at 2pm, with just a $350 buyin. They’re also running an 8-Max 7-Game Mix event on 7 January (HORSE, PLO, NLHE) with a $200 buyin. Saturday, 6 January is the beginning of more than two weeks of tournaments at the Tulalip Poker Pow Wow, starting off with some smaller events and ending mid-month with a $100K GTD $520 buyin (including dealer addon) with three entry days. Los Angeles Poker Classic 25 opens 9 January at Commerce Casino in Los Angeles, spanning nearly two months with 67 tournaments. 11 January is the beginning of Thunder Valley’s World Series of Poker Circuit, the closest approach the WSOPC makes to Portland. Remember to keep an eye on the #PNWPokerCal Twitter hashtag and the PNW Poker Calendar for upcoming events! Molly’s Game—about the woman who ran high-stakes poker games for the Hollywood elite—opens Christmas Day here in Portland at Fox Tower (and in other selected markets). Full release across the country on 1 January. After a week without any big action, Pacific Northwest players hit the World Poker Tour Five Diamond in a big way. On top of the list is Couer D’Alene’s Dylan Linde, who started off with a 3rd-place finish in the $5,200 buyin Event #13 at Bellagio, made it to the unofficial final table for 10th in another $5,200 buy-in (Event #21), then wandered over to the Venetian/Card Player Poker Tour Main Event to nab 6th place. Cashing just ahead and behind of Linde in Event #21 were Dylan Wilkerson from Seattle and Mercer Island’s Darren Rabinowitz (who also took 17th in the Venetian tournament). Finishing a couple of spots ahead of Linde at the Venetian was Vancouver, Washington’s Almedin Imsirovic, following up on a 4th-place finish at the WSOP Circuit Las Vegas reported here a couple of weeks back. It was his second-largest recorded tournament cash. Day 2 of the #CPPT @VenetianPoker December Extravaganza $3,500 main event is in the books! Almedin Imsirovic leads the final 25 returning for day 3. Moving out of the Las Vegas scene to Los Angeles, Matthew Rosanbalm (Oregon City) wraps up a year of cashes that only goes back to the WSOP Monster Stack this summer, with a 3rd-place finish in at the Bicycle Casino WSOP Circuit Event #7. There’s a trend for big buyin, live sit and go tournaments happening. 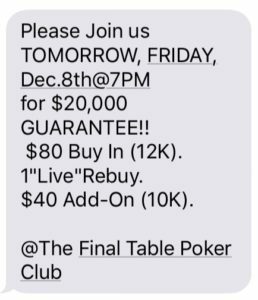 Stones Gambling Hall near Sacramento has an $1,100 buyin single-table tournament 26 January and 23 February (the fourth Friday of each month) at 5pm. Players start with 100K in chips (100bb deep), no chops allowed (Angela…), with $6K to first, $2K to second, and $1K to third. Best of all, it’s live-streamed. 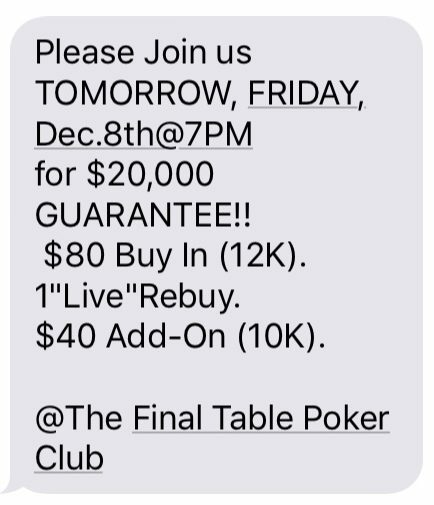 I have less info on the $3K SIT N GO scheduled for 3 January on Live at the Bike. Bart Hanson is the scheduled commentator; if the payouts are similar, first prize should be over $16K. Family matters kept me busy most of the week; I played a couple of Thousandaire Makers, an online $25K GTD and a $3K GTD. It feels like the least poker I’ve played in years, but my tracking software tells me it’s not. There are satellites every today and next Wednesday at 1pm for the Tulalip Poker Pow Wow coming up just after the first of the year. The satellites are $60, with 1 out of 10 entries winning a seat into the Main Event, with an extra seat added to each tournament. There’s another satellite on Saturday the 30th at 3pm with a $120 buyin, 1 Main Event seat for every 5 entries and 2 added seats. The Venetian New Year’s Extravaganza runs from Thursday through 7 January. Opening weekend is a $100K GTD with a $340 entry fee. It wraps up on Christmas Eve after two entry flights on 22 and 23 December. The big tournament of the series starts 27 December, a $250K GTD with a $400 buyin. There are three entry days, Day 2 is 30 December and you can get home with your winnings for New Year’s Eve! The Gardens Poker Championships starts 1 January at The Gardens in LA. There’s a $550 buyin PLO 6-Max on 2 January, a (limit) Big O/7-Card Stud Hi-Lo tournament ($340 buyin) two days later, and a single entry day $100K GTD on the first Friday of the new year ($175 buyin, $100 addon). Heartland Poker Tour is at Ameristar East Chicago starting 4 January, with a $200K GTD opening event (starting days 4–6 January at 2pm, with just a $350 buyin. They’re also running an 8-Max 7-Game Mix event on 7 January (HORSE, PLO, NLHE) with a $200 buyin. Heads up at the 2016 World Poker Tour Five Diamond Poker Classic: Ryan Tosoc (left, and the winner of the 2017 event) and James Romero (right). Photo via WPT. 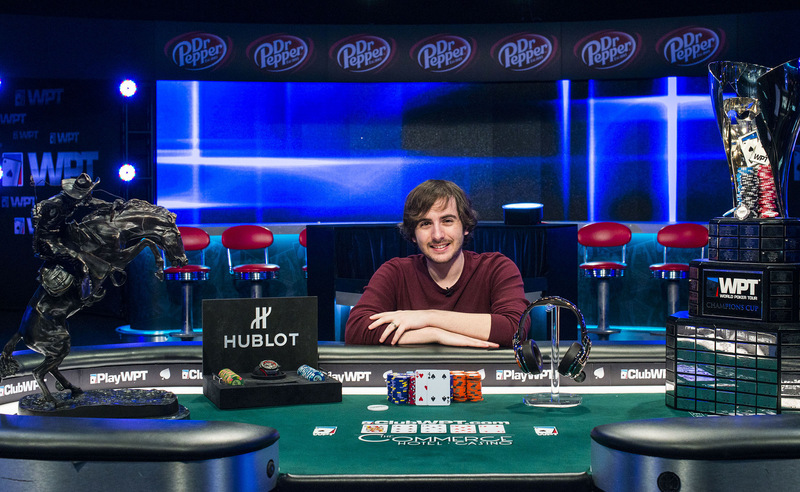 The WPT Five Diamond World Poker Classic closed out on Sunday, with Chicago’s Ryan Tosoc—last year’s 2nd-place finisher—coming in first this year in a record-setting field. But if you were watching the live stream on PokerGo, you might have missed the fact that the first episode of last year’s Five Diamond—won by James Romero of Portland—was airing early Monday morning on Fox Sports. Igor Yaroshevskyy, Justin Bonomo, Alex Condon, Jake Schindler, and, of course, Tosoc. Worth watching again or catching it for the first time if you missed it’s first run. And if you happened to have a bunch of last summer’s WSOP Main Event live coverage from ESPN recorded that you were watching in the background, you might have seen a familiar face, though Lon and Norm seemed to think he was from the other Vancouver. The summer WSOP schedule has been released earlier every year that I’ve been paying attention, but Barry Carter at pokerstrategy.com wrote an article on Friday about an accidentally-published version that showed up on the ClubPoker forum before it was put back under wraps. Then, on Tuesday, the official schedule was released, and plans for the summer kicked into high gear. 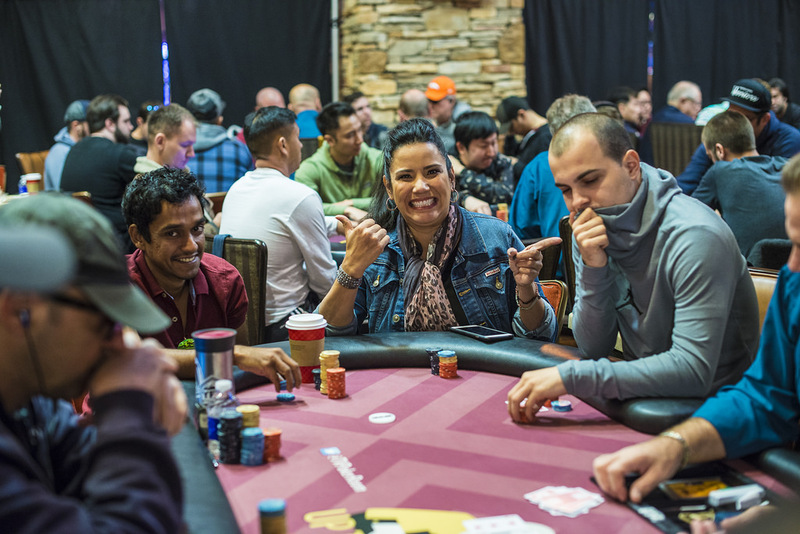 There are 78 bracelet events on the docket, with more than a dozen of them kicking off after the Main Event, which has typically come close to the end of the list. New events of particular interest to the Poker Mutant are Event #11 $365 GIANT PLO which runs on five consecutive Sundays, with a Day 2 in July; Event #47 $565 WSOP.com PLO 6-Max in late June; and Event #67 $1,500 PLO oogle D just after the Fourth of July. Of course, there’s lots more stuff but as usual it’s going to come down to a race between what I can afford to play and how much time I can get off from work! Kenny Hallaert has already posted the Google Sheets link for his combined 2018 Las Vegas summer series schedule with the WSOP events. The next couple of weeks are kind of quiet for poker tournament series—even in Los Angeles and Las Vegas. The Venetian New Year’s Extravaganza runs through the Christmas season (see below), but most of the other venues just have regular schedules running until 2018. That’s only a couple of weeks away, though, so let’s look out a couple of months at what the new year brings for Northwest players. At Gardens Casino in LA, the week-long Gardens Poker Championships start on New Year’s Day. I hesitate to mention them, because there was a bit of a scandal there just a couple of months ago, when they added flights and pushed out Day 2 of a $1M GTD tournament. There’s a 12-day HPT series in Chicago stqarting a couple of days later, then two weeks of tournaments at Tulalip Casino north of Seattle starting the first Saturday of January. On 9 January, the Los Angeles Poker Classic starts it’s 25th run, with events all the way through to 1 March. The WSOP Circuit Thunder Valley is north of Sacramento two days later. Tulalip, the LAPC, and Thunder Valley are all running the third week of January when the Venetian January Extravaganza plays for six days. Near the end of the month, Oceans 11/Card Player Poker Tour has a weekend in San Diego. Then it’s just the LAPC running until 7 March, when HPT Golden Gates returns to Colorado. The middle of February has a WSOPC at the Rio in Las Vegas starting a day before the Chinook Winds PacWest Poker Classic at the beach in Lincoln City. That’s not to mention stuff here in town like the 12th Annual NW Deaf Poker Tournament in lat3e February and a hinted series at Portland Meadows next month. We’re going to have a series at Meadows in January and the Chinook series is Feb 17-25 with half a million in guarantees! Just not this week. I didn’t play anything live or online most of the week due to some emergency family business, then got to Final Table’s impromptu $20K last Friday just vbefore the end of entries, did a rebuy and addon, and promptly started a decline, then misclicked trying to put out an amount easier to make change from that ended up being just enough to trigger a raise (should have said “call”!) After that it was a fast slide and out the door in 35 minutes. Missed out on an overlay of more than $2K. I played a bit online over the weekend, in-between other projects,making it about two-thirds of the way through both a Hundredaire maker and a Thousandaire maker, profiting in some PLO cash games, and cashing 6 of 15 Jackpot Sit-n-Gos (including a couple 5x multiple jackpots). Sunday, I came very close to cashing one of the Ignition 12 Days of Turbo events, a $15K GTD tournament with 222 entries, after making a royal flush at a critical point when I was short-stacked. Buuuut, 41st place with 36 paying. There is an announced $25K guarantee freezeout tournament for Saturday, noon, at Portland Meadows. There are satellites every Wednesday through December at 1pm for the Tulalip Poker Pow Wow coming up just after the first of the year. The satellites are $60, with 1 out of 10 entries winning a seat into the Main Event, with an extra seat added to each tournament. 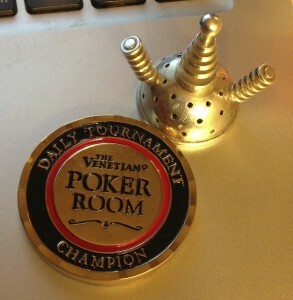 Sunday art 11am is a $10K Added tournament with a $230 entry (including dealer addon). The Muckleshoot Tournament of Champions is Sunday at noon. It’s a $400 buyin if you haven’t already qualified (and if there are seats left in the 250-player limit). The Venetian New Year’s Extravaganza runs from 21 January through 7 January. Opening weekend is a $100K GTD with a $340 entry fee. It wraps up on Christmas Eve after two entry flights on 22 and 23 December. It was almost exactly seven years ago that I started up Mutant Poker. I was talking to Brad Smith—owner of Hot Pepper Studios, a local website and mobile application development shop; a long-time colleague; and currently my boss—about my own struggling freelance software development business and my interest in poker, and he was the person who suggested I start a poker blog, knowing that I had run a personal blog on multimedia programming and politics for several years. Brad didn’t give me any direction on what to write. He didn’t write a blog, read poker blogs, or play poker, he was too busy with work and with running the WebVisions series of conferences in Portland, Chicago, New York, Berlin, and Barcelona. But I took the advice and ran with it, at first obsessively breaking down every tournament I played on Full Tilt, PokerStars, and Cake Poker. Then, about four months after I started, Black Friday happened, and I started playing live tournaments more often, including the first live game bigger than a couple of tables that I ever won. In the first days, I kept extensive notes which enabled me to do more complete write ups and reviews than I’ve done for live games in a while. 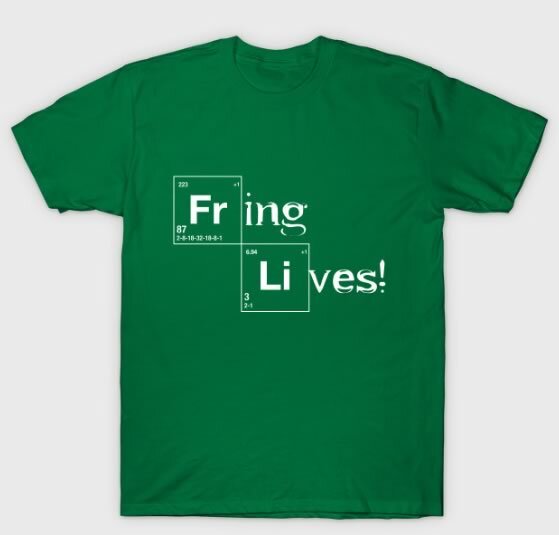 I was already using the original version of my Professor Frink card cap by that point. Production took a dive, though, both from having to take notes and being away from the computer: I wrote an average of nearly 20 posts a month between January and April, but was down to six a month for most of the year. Winning a $10K at Encore Club in November kicked me back into production as I briefly held the title of the largest single prize in a regularly-scheduled Portland poker tournament at the end of 2011 and was doing my best to get to EPT Prague for my 50th birthday (Surprise! It wasn’t good enough). This was about the time I started to do my own crude statistical analyses, including Why Not Rebuy?, one of the more popular pieces on my site over the years. Only one article per week average in 2012, and that was mostly front-loaded by a prolific February. I headed down to Las Vegas in June for my first extended poker trip, shortly after publishing another long analysis piece: How Good Is Good Enough? The data there was derived from the long-dormant but still informative wsopdb.com, which lets you do a search by name to find all of a player’s buyins at the WSOP for 2011 and 2012. That was the year I (briefly) played my first bracelet event, starting at a table with Kevin Stammen and Ivan Demidov. Wheeee! Apart from spending a lot of time (and playing a partner tournament with) WSOP bracelet-winner and programming colleague Tomer Berda, it wasn’t a great trip (shoutout to fellow Reed alum Mark Humphrey for putting me up for half of that run!) I didn’t write anything for a month-and-a-half. Played out at Wildhorse Casino for the first time that fall, after winning a Main Event seat at Portland Players Clubround-up of Oregon players at the WSOP the night before my wife had a heart attack (not a joke). I also did a by combing through the entry data, which was sort of the initial start on the path that led to the blog becoming a sort of clearinghouse for news about Pacific Northwest poker tournaments. A follow-up to that post, showing the progression of Oregon players through the various days of the 2012 Main Event is the first time Angela Jordison’s name appears on the blog, several years before I’d heard of her. (that was after Grand Sierra Resort cancelled the remainder of a series after missing a couple of large guarantees, without sending out notices to, say, registered guests who’d already checked in for a flight the morning they cancelled). A week later I cashed in the Deepstacks Poker Tour/Chinook WInds Oregon State Poker Championship Main Event, where I first met Toma Barber. I stepped up a little bit in 2014, but what really kicked things off was In the Money, a sort of culmination of the analytical articles I’d been working on and the analysis I’d been running of my own experiences, not to mention a quote from Bryan Devonshire. A shorter version appeared at PokerNews—which led to me writing pieces for them for a couple of years—and then Deadspin published the piece in its entirety (for which they still have not paid me). That actually led to a 2+2 News, Views, and Gossip thread, then some podcast interviews with Limon. I got busted by a gazillionaire at the Wynn. That November, I did my first round-up of upcoming tournament series in the West and started up the Pacific NW Tournament Calendar. 2015 saw a return to volume. I wrote an expansion of a PokerNews article on WSOP Main Event Payout structures. That led to a couple of mentions on the 2+2 Pokercast. I also did a piece on the profitability of the top players in the World Poker Tour. It was my first year as a media observer at the WSOP, then I did a day-by-day collation of Pacific Northwest players in Las Vegas series for June and much of July (more work than I can even imagine doing at this point). The Planner started up shortly thereafter. That’s been the bulk of posts for the past two-and-a-half years, aside from the summer of 2016, when it was on hiatus while I was working as a live reporter at the WSOP. Thanks to everyone who’s provided encouragement and feedback since I started up. I hope some of you find some of this info useful or at least mildly amusing! If nothing else, it keeps me off the felt Tuesday nights. There was some serious Portland player action going on down at the WPTDeepstacks Championship at Thunder Valley the other day. Angela Jordison managed to come in third in the Player of the Series standings, despite playing only three of the none qualifiers, then she made a deep run in the Main Event, in spite of a Day 2 starting table with Bryan Devonshire, Upeshka DeSilva, and Cord Garcia (in addition to Angela herself). She missed the money, but Jeff MItseff took 17th, working a diminished stach for hours after losing some big hands. Those results won’t be up on Hendon Mob‘s leader boards until next week. Dirk D’Hooge of Walla Walla was at the Belgian Poker Challenge NLHE 8-Max Championship for a second place finish as the only US player to cash. It’s only his third recorded cash (all have been since this summer) and the largest by far. Closer to home, Vancouver’s Ali Imsirovic jumped across Las Vegas Blvd. from Planet Hollywood’s WSOP Circuit event to the Bellagio to play the first event of the WPT Five Diamond series, a ($10K High Roller), after his run at the WSOPC Main Event final table the week before; he came in 4th once again, though in a much smaller field of 28. Also at the Five Diamond, Scott Clements took first place in a field of 56 in Event #5, the $1,100 PLO. Kendra “Gypsy” Hurteau has done a series of paintings that include her visions of three area poker faces (including Jake Dahl). She and I were neighbors for much of the summer I was working in Las Vegas. You can see her work at her web site. 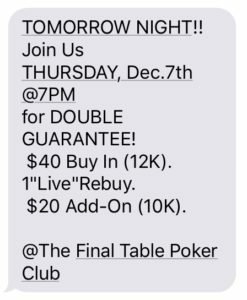 No special events announced so far this week except for a double guarantee ($2,400) this morning at Final Table’s 11am game. Probably because it’s my birthday. HOLD YOUR HORSES! 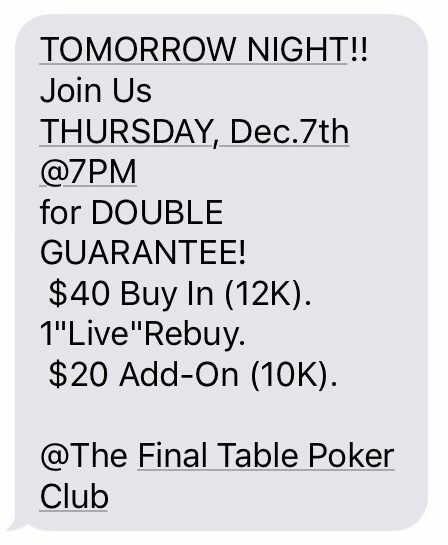 Double guarantees Thursday night and Friday night at Final Table! There is an announced $25K guarantee freezeout tournament for Saturday, 16 December, at Portland Meadows. The Main Event of the WPT Five Diamond at Bellagio started yesterday (the last-minute Day 2 Turbo satellite is probably over by the time you see this). There are still a couple of events remaining, including a $5,200 buyin tomorrow, a $25K buyin High Roller on Friday with another on Saturday, and a Turbo $1,100 tournament on Sunday. HPT St. Charles’ $2,500 entry HPT Championship Open starts Friday, with flights through Sunday and three total days of play. The WSOP Circuit Bicycle Casino has a $240 buyin Big O (pot limit) tournament today iof you can get there by 2pm. The Main Event ($1,675 entry) has flights Saturday and Sunday. There are also two Survivor tournaments this weekend: Sunday’s $390 game pays $3,250 to the top 10% and Monday’s is $565 for a $5,000 payout. $3,250 is—oddly enough—the buyin for Monday’s High Roller, a Circuit Ring event. Monday was the beginning of the Venetian December Extravaganza. The $3,500 Card Player Poker Tour $500K GTD starts Friday. There are satellites every Wednesday through December at 1pm for the Tulalip Poker Pow Wow coming up just after the first of the year. No info yet on the price or the package you win. 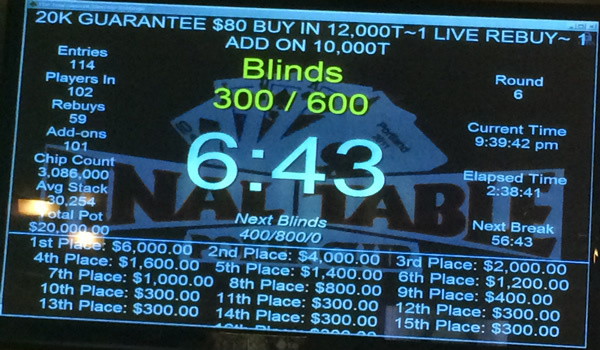 Tulalip also has a $10K Added $230 entry tournament coming up on Sunday, 17 December at 11am. 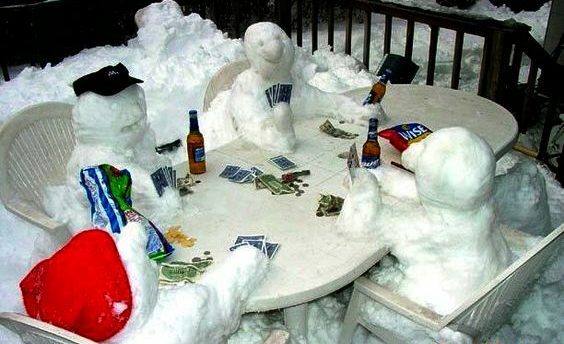 The Medford Poker Room Holiday Tournament is Saturday at noon. The Muckleshoot Tournament of Champions is 17 December at noon. It’s a $400 buyin if you haven’t already qualified (and if there are seats left in the 250-player limit). After that, there’s not much through the holidays except the Venetian New Year’s Extravaganza on 21 December.